Stambolovo Winery - one of Bulgaria's showpiece wineries, the highest quality and most typical Merlot wines in Bulgaria. STAMBOLOVO WINERY, as well as its vineyards and premises, is situated in South Bulgaria in close proximity to the borders with Greece and Turkey. The region is of key geographic importance. The shortest road from Europe to Asia and Asia Minor passes through these lands. Most probably this was the route by which the first vines were brought into what is today the territory of Bulgaria. This fact should to a large certainty determine the region as one of the first winemaking centres in Europe. With a history of almost 80 years in business, at present the winery is among the leading winemakers in Bulgaria. 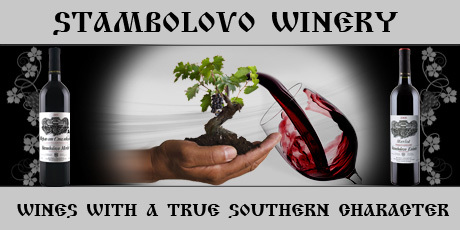 Due to the beneficial climatic and terroir characteristics of the region, as well as to time-proven quality and traditions, today the STAMBOLOVO brand name is regarded by most wine business professionals as the winery with the best, highest-quality and most typical Merlot wines in Bulgaria.